Japanese Episode DP 024: "Confrontation! Satoshi vs. Pikachu!?" American Episode 488: "Cooking Up A Great Story!" While training for Hikari's next Pokemon Contest, our heroes are approached by a young woman named Tamami. After revealing that she owns a cake shop with her aunt Amano, she asks Satoshi to borrow his Pikachu! She tells our heroes that Amano's been really upset since her Pikachu, Sugar, disappeared a little while ago. Tamami believes that if Amano is convinced that her pokemon has returned, she'll snap out of her depression and be ready for her upcoming baking competition. Satoshi agrees to help, so Pikachu pretends to be Amano's pokemon. Tamami's aunt falls for it and spends the day picking berries with the pokemon. After Amano and Pikachu fend off an attack from the Rocket-Dan, she tells Satoshi that he should have a battle with her. Satoshi, not wanting to spoil Tamami's ruse, reluctantly engages in a battle against his Pikachu. 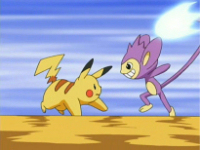 His Aipom is about to land a powerful attack when Amano throws herself between the two pokemon and admits defeat. Later that night, Satoshi decides to tell Amano the truth after witnessing the love she displayed for Sugar. However, when he tells her, Amano says that she already knew! She then reveals that she thinks the reason Sugar ran off in the first place was to figure out a way to break open the shell of a Nanashi Berry that she had needed for one of her recipes. Suddenly, the Rocket-Dan reappear and kidnap Pikachu! The Rocket trio seems to be getting away when an electric attack from a Raichu stops their mecha in its tracks. Before long, Amano realizes that the Raichu is none other than her Sugar! After sending the Rocket-Dan blasting off again, Amano happily reunites with her beloved pokemon. Raichu is now strong enough to break open the berry shell, so Amano and Raichu prepare a special cake to thank our heroes for all their hard work. Satoshi and his friends often drop everything to help out a stranger in need. That's nothing new. But in this episode, they're asked to take three whole days out of their journey to help fool an old woman into thinking that her beloved pokemon has returned. I'm sorry, but that's just a bit much, if you ask me. I mean, fine, they get free lodging and a sickening amount of cake for free. But the gang's willingness to just do whatever in this situation is ridiculous, even by Pocket Monsters standards. Ignoring that, however, we have a pretty solid episode. The Satoshi vs. Pikachu battle was really well-done, and Amano being an older character who knows what she's doing is a refreshing change of pace from the other old women we've had on this show. The dub kind of goes into a 4Kids "making stuff up just for the hell of it" mode for a little bit, but other than that, everything else is pretty much the same as it always is. Raichu keeps its Japanese voice. Ash: "Was your Aunt Abigail a pokémon trainer?" Theresa: "She competed in the Grand Festival!" No, Ash, she didn't compete in the Grand Festival. The dub kind of elevates Abigail to this super Coordinator status that she doesn't have in the original version. I mean, she is a gifted trainer and all, but let's not exaggerate things here. Three seconds are tacked on to the last bit of the episode.